July 24, 2017 0 comments on "Canning Potatoes"
Interested in canning potatoes? Potatoes are a vegetable that sometimes people forget that they can preserve for winter by pressure canning. I know that whenever I try to store potatoes for the winter I have a hard time getting them to last all winter without them going bad. If you are wondering about what you can do with canned potatoes, they are great for making a quick hash for breakfast or dinner. You can also use them to make potato salad or soups or stews. The pressure canning process completely cooks them so they are cooked and ready to go when you need them. Peel potatoes, cut into small cubes. (Some people might tell you it’s okay to leave the peels on some types of potatoes, but it is recommended by experts to peel ALL potatoes before canning because the peels can contain harmful bacteria). Place cubed potatoes into large stock pot and cover with water. Boil for 2 minutes to heat potatoes all the way through. 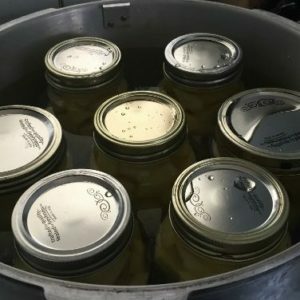 Ladle heated potatoes into sterilized pint or quart sized canning jars. Fill jars with boiling water, leaving 1 inch head space. Wipe rims of jars, and put sterilized lids and rings on jars. Process in pressure canner at 10 pounds pressure for 35 minutes for pints and 40 for quarts.